In this post, I will try to outline some of the key concepts behind Activity Theory and then compare it to the Learning as a Network (LaaN) perspective/theory. The cultural-historical theory of activity (Activity Theory) has grown out of the work of Vygotsky, Leont’ev and other Soviet socio-cultural oriented psychologists. Activity Theory approaches human cognition and behavior as embedded in collectively organized, artifact-mediated and object-oriented activity systems (Vygotsky, 1978; Leont'ev, 1978, Engestörm, 1987). According to Engeström (1999b), an activity system "constantly generates actions through which the object of the activity is enacted and reconstructed in specific forms and contents - but being a horizon, the object is never fully reached or conquered" (p. 381). Activity Theory develops from the work of Vygotsky, particularly his arguments that human development and learning is mediated by artifacts, such as language, signs, and symbol systems. The classical representation of an activity system is a mediating triangle comprising three central components, namely subject, object, and mediating artifacts (Vygotsky, 1978). Activities are social practices oriented at objects. An entity becomes an object of activity when it meets a human need. The subject constructs the object using mediating artifacts (Engeström, 1999b). Leont'ev, (1978), drawing on Vygotsky's foundational work, points out that there is a crucial difference between an individual action and a collective activity and extends Vygotsky's original model into a model of a collective activity system. Leont’ev’s conceptualization includes division of labour, which helps to differentiate between what is accomplished collectively or individually. Leont'ev further adds a distinction between activity, action and operation, as three different levels of human practice in order to delineate an individual's action from the collective activity (Leont'ev, 1978, Section 3.5). Inspired by Leont'ev's work, Engeström (1987, 1999a) also notes that the problem with Vygotsky's classical representation of an activity system is that it does not fully explicate the societal and collaborative nature of the human actions. 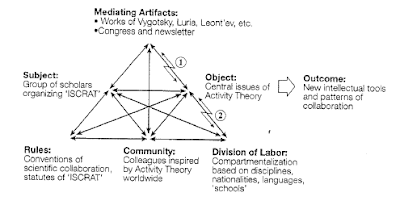 He then graphically expands Vygotsky’s original mediating triangle with a social component by including three contextual factors, namely community, rules, and division of labor. Engeström uses this expanded activity system model as the basis for his theory of expansive learning, which focuses on the expansive transformation of the object of activity in a collective activity system (Engeström, 1987, 1999b). 7. consolidating its outcomes into a new, stable from of practice. However, in the new knowledge intensive era, it is increasingly evident that knowledge is highly complex and that dealing with knowledge is definitely not reducible to any sequence of actions. The actions which form Engeström's expansive learning cycle are not the only kinds of actions that must be mastered and performed in highly complex knowledge ecologies. LaaN does not postulate a predetermined sequence of actions; it rather enables a wide range of learner-driven actions that are neither predetermined nor predictable. In general, using Activity Theory as a framework for the analysis of activity in complex learning environments has a major limitation. Learning as a complex activity cannot be captured by an overarching activity system (or even a network of activity systems) purposefully oriented toward the achievement of an object of activity. Learning is multifaceted and dynamic, and activities in a learning environment are fuzzy, varied, and often fragmented, which makes it very hard to elicit a complete picture of the activity system(s) under observation, encompassing, in activity theory terms, an evolving set of subjects, objects, mediating artifacts, actions, rules, norms, and division of labour. The solution to this problem is to understand the learning activity from the learner's point of view. Whereas in Activity Theory the prime unit of analysis is an artifact-mediated and object-oriented activity, LaaN rather focuses on the individual learner and her PKN. In activity theory, you are what you do. In LaaN, you are what your PKN is. - Engeström, Y. (1999a). Activity theory and individual and social transformation. In Y. Engeström, R. Miettinen, & R. L. Punamäki (Eds.) Perspectives on activity theory, (pp. 19–38). Cambridge: Cambridge University Press. - Engeström, Y. (1999b). Innovative learning in work teams: Analyzing cycles of knowledge creation in practice. In Y. Engeström, R. Miettinen, & R. L. Punamäki (Eds.) Perspectives on activity theory, (pp. 377–404). Cambridge: Cambridge University Press. - Engeström, Y. (2001). Expansive learning at work: toward an activity theoretical reconceptualization. Journal of Education and Work, 14(1), 133 – 156. - Vygotsky, L. S. (1978). Mind in Society: The Development of Higher Psychological Processes. Cambridge, MA: Harvard University Press. I thought this was a great summary of the evolution of Activity Theory. I'd be curious as to your thoughts on this: when you look at Engestrom's (2001) example of the hospital context with different activity systems connecting and overlapping, that is completely describing a PKN, and that is why to me, LaaN is no different than third generation activity theory. AT describes very well both collective and individual activity, and can describe complex learning situations very well, since it provides a means of looking at large units of analysis (eg. a hospital environment with many levels of activity and activity systems). If the distinguishing component of LaaN and AT is the absence of any specific object, then Nardi's (1996) distinction between AT and situated learning comes to mind.